If you're homesick, come here for all the tastes and flavours of the Commonwealth. 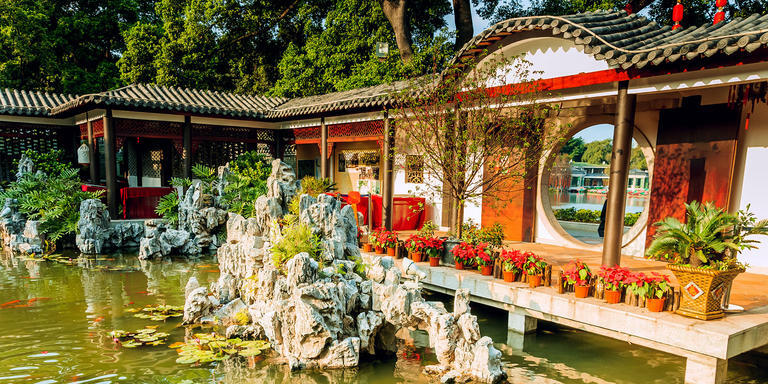 Leave hectic and modern Guangzhou for a restorative visit to the English past. Located in a restored colonial mansion, this is a favourite spot for ex-pats of stripes. Once you've crossed the green courtyard and passed through the lobby, take a gander at the cocktail menu. You have never seen so many variations on the theme of Martini. If you can't decide, go for a margarita. According to your level of hunger, go for the spaghetti with cuttlefish and fennel served with sole filets, Rougié duck breasts with winter squash and chestnuts or halibut wrapped in prosciutto and baked in seafood bisque. Succumb to the famous orange cheesecake, matcha milk mousse or mixed nuts parfait.